The graph above shows how NZ First have done in every public poll since the 2005 election. 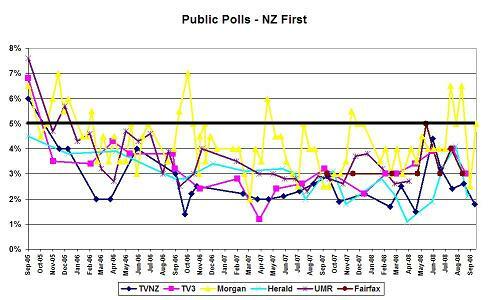 There appears to be a significant difference between the level of support for NZ First in the Roy Morgan polls, as opposed to the five other polling companies. This is not to say Roy Morgan is necessarily wrong – just that there is some sort of systematic or methodological recurring reason why they show a higher level of support. I don’t have available the full methodology used by Roy Morgan, so it is hard to speculate on why they get such different results. It might be linked to the fact they poll around 60 people a day and report in two week intervals, rather than the shorter time frames of the other polls.